1 3/4 cups coarse-ground coffee in a 2-quart pitcher. 1 of 3 Place 1 cups coarse-ground coffee in a 2-quart pitcher. Add 31/2 cups cold water and stir to combine. Cover with plastic wrap and let steep at room temperature for at least 12 hours or up to one day. 2 of 3 Line a fine-mesh strainer with a standard coffee filter and fit it over a wide-mouth jar or pitcher. Slowly pour coffee into filter until all liquid has passed through. Discard filter and grounds. 3 of 3 Cover coffee and refrigerate until completely chilled, at least 2 hours or up to 5 days. 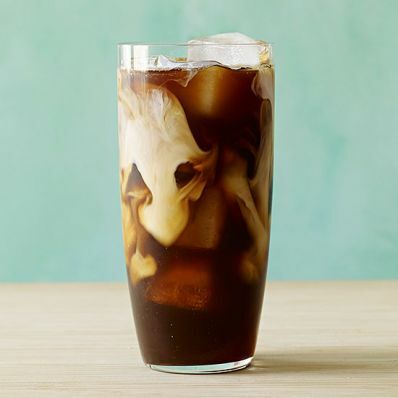 For each cup of iced coffee, dilute the concentrate with an equal portion of milk, half-and-half or water, and top with ice. If you want to sweeten the deal, try a little simple syrup (combine equal parts water and sugar, bring to a boil and cool); it blends better than sugar in cold drinks. For hot coffee, start with one part concentrate to 2 to 3 parts boiling water per mug.